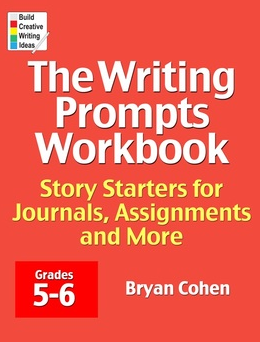 Bryan Cohen, the author of 1,000 Creative Writing Prompts and 500 Writing Prompts for Kids, has compiled 200 of some of his best prompts for fifth and sixth graders in this workbook. Use them for journals, assignments, poems, conversations, songs and more. 58. Imagine that one of your ancestors (like your great-great-great grandmother) was somebody very important and famous. Tell the story of this person from your family and what made them such a national treasure. 113. Write a scene or a story with the characters of your heart, your brain and your soul. 182. Is there gadget in your life that you couldn't live without? Perhaps your iPod or your cell phone? What is the gadget and what would it be like if you were not allowed to use it for an entire week?